Titan Framework offers a broad range of options which you can add in a plugin or a theme to provide end users with dynamic settings. Today I am going to discuss cover two of the most basic options: a text type option and a textarea option. 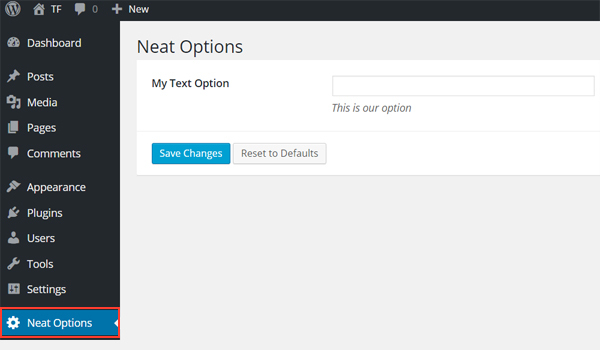 Let's see how to create a text type option in an admin panel, a metabox or a theme customizer section. name: This controls the name with which the option is displayed. id: A unique name which is used to get the saved values. desc: It displays a brief description with the option name. default: This parameter specifies the default value of the option. livepreview: (Optional) This parameter is only used when a text type option is being used inside the theme customizer section. 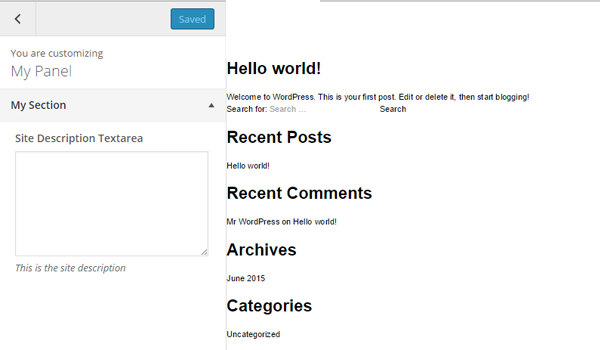 It helps to display a live preview of changes in your theme. css: (Optional) When a text field is added inside an admin page or a theme customizer section this parameter can help generate CSS. How? 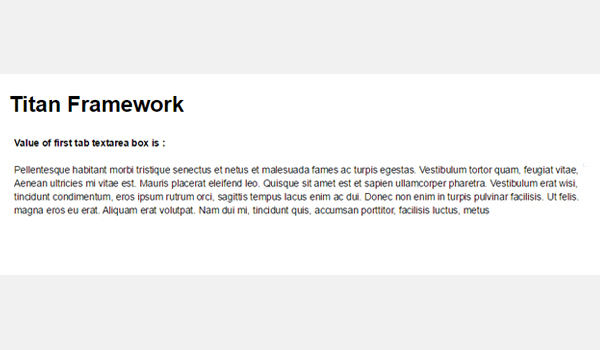 placeholder: (Optional) This displays dummy text each time the text field is empty. is_password: (Optional) An additional label, located immediately after the form field. Accepts alphanumerics and symbols. Potential applications include the indication of a unit, especially if the field is used with numbers. For example, if you use the field as input for numbers of pixels, you would enter the value as ‘px’. Or, if as a unit of percentage, you’d enter ‘%’ as value. All of these parameters are of type string expect for the is_password parameter which is boolean. 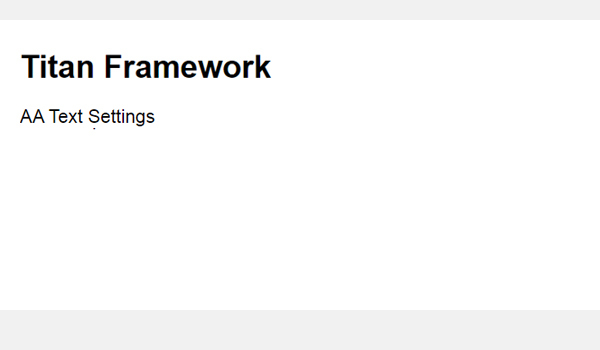 If you don't need the optional parameters, there is no need to include them. Call a unique instance via the getInstance() function. Create options via the createOption() function inside a container. Get the saved option's values via the getOption() function. So, let's review how a text type option is created inside each of these containers. This code will add a text type option inside an Admin Panel $aa_panel. 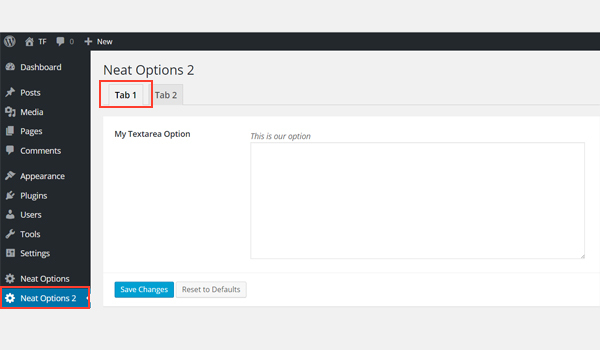 The createOption() function takes up an array of parameters which are supported by the text option. In this case, I've used parameters like id, type, name and desc. Off all these, ID is most the important parameter and should always be unique. It will be used later to get the saved values. So, a text option with ID aa_txt and name 'My Text Option' was created within the admin panel $aa_panel. The screenshot above shows My Text Option inside the admin panel Neat Options. This is a custom admin panel and has been created with Titan Framework. If you want to know how, then refer to the previous articles of this series. Use the following code to retrieve the saved values from this text option. I used the ID of the text option as a parameter inside the getOption() function and saved the value in a variable $aa_txt_val. Voila! All that's left to do is to use this value, which I did by using the echo command. Let's suppose I entered the demo value 'AA Text Settings' and saved it. So here is the screenshot of the output of the code above. Let's look at the code of a text option inside an admin tab. This time I created a text type option with ID aa_txt_in_tab1_panel2 inside $aa_tab1. $aa_tab1 is an admin tab which exists inside a custom admin panel $aa_panel2. The process of creating an admin tab has been explained in my previous articles. So, you can refer to them for help. Note that I've used the same name, which means that names can be the same, but IDs are always unique. 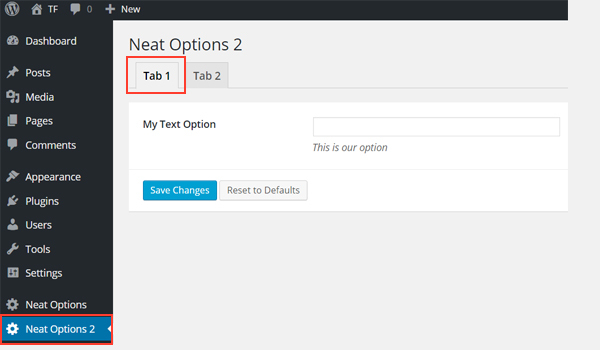 The above screenshot shows the My Text Option inside Tab 1 of panel Neat Options 2. Let's retrieve the saved values from this text option. // Value of first tab text box. The getOption() function retrieves the saved value via ID aa_txt_in_tab1_panel2 and then I printed it via the echo command. Again the createOption() function adds a text option inside a metabox named $aa_metbox. Same parameters are used here and the ID is aa_mb_txt. 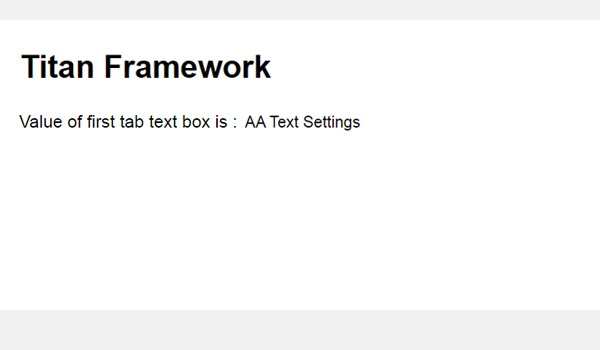 The above screenshot displays a page editing screen where you can find a new metabox with 'My Text Option' inside it. We created metaboxes in a previous article of this series, so refer to that if you need to revise your concepts. So, here is the code to get the saved values. 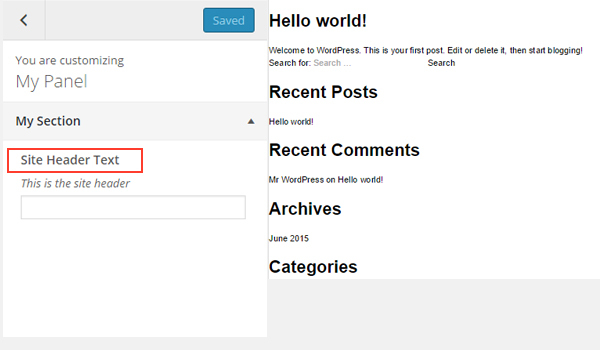 get_the_ID() function, which will return the ID of the current post/page/post_type. After that, I just used the echo command and printed the value. I saved 'AA Text Settings' as the value of this option and published the page. The code above was used to display that value at the front-end. 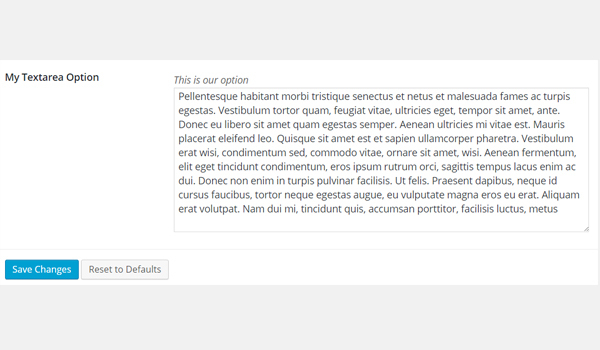 Finally, let's write the code for creating a text type option inside a theme customizer section. A text type option with ID aa_sec_head_txt is created inside a theme customizer section $aa_section1. 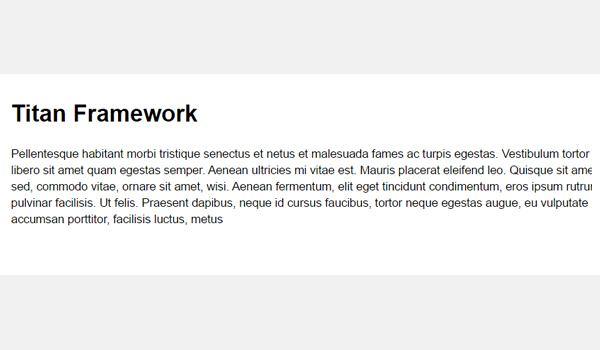 Refer to my previous articles if you want to learn how to add customizer sections in Titan Framework. 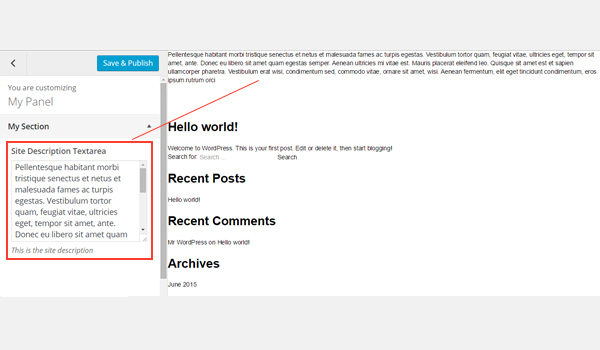 The above screenshot shows a theme customizer section named My Section in which a Site Header Text option is being displayed. Here is the code to get the saved values. aa_sec_head_txt is a text type option, and I retrieved its value again with the getOption() function. No rocket science here. 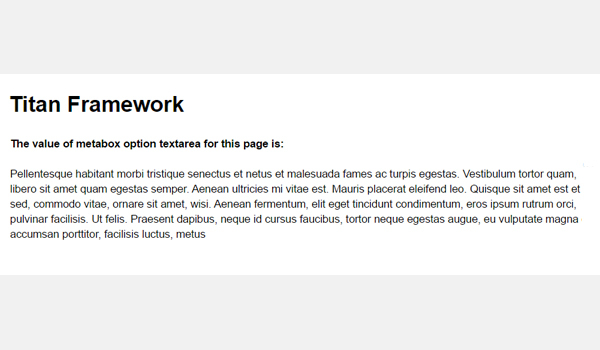 Next, let's cover the textarea type option in Titan Framework. 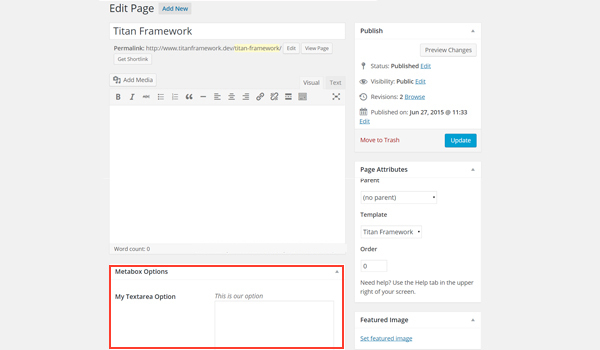 Let's review how you can leverage Titan Framework to create a textarea type option in admin panels, meta boxes and the customizer section with just a few lines of code. name: This parameter decides the display name of the textarea. id: This is a unique name which is used to retrieve the saved option values. desc: It displays a one-line description with the option name. default: (Optional) It represents the default setting of the textarea option. livepreview: (Optional) This parameter works exclusively with the theme customizer section and shows a live preview of changes which you make. css: (Optional) It generates CSS each time a textarea option is created inside an admin page and/or theme customizer section. placeholder: (Optional) If you want some dummy text to appear inside your textarea option then use this parameter. is_code: (Optional) This parameter performs a check for better-looking code input and if it is true, then the font of the code becomes monospaced. All parameters are of the type string, except for the is_code which is boolean. Call the getInstance() function at the beginning of every new file when Titan Framework is being used. Use the createOption() function to add any new option. Get the saved option values by calling the getOption() function. Keeping things to the point, I'll only explain how to add this option inside these containers. If you want to know how to create these containers, then read previous articles of this series. 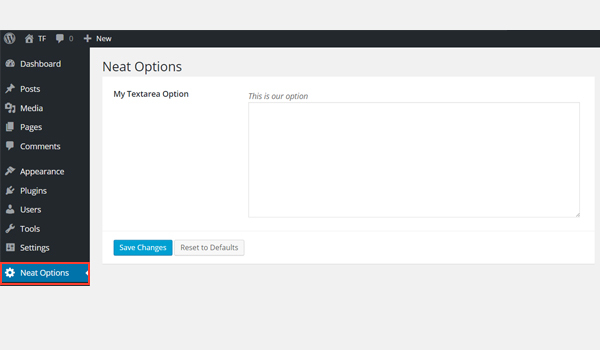 I will create a textarea option inside an admin panel with the following code. 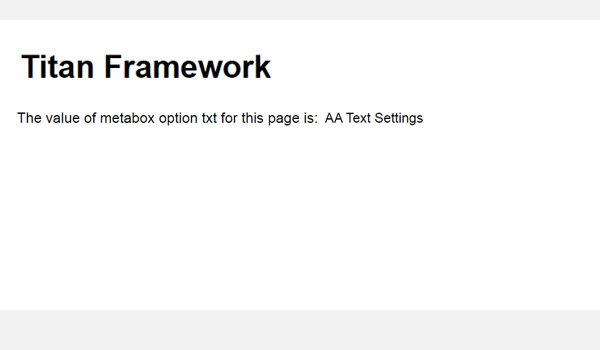 A textarea is created inside an admin panel $aa_panel via the createOption()function. This function takes up an array of parameters and I'll only use those which the option supports. I've used id, type, name and desc. The parameter type is what determines which kind of option it is. A textarea option with ID aa_txtarea and name My Textarea Option is shown in the above screenshot, which we just created. Now I'll retrieve the saved value of whatever an end user enters inside this textarea. To retrieve the saved values, first get a unique instance via the getInstance() function, followed by the getOption() function, within which we use the ID of textarea as a parameter. Later, print the saved value at the front-end via the echo command. Let's enter any dummy text inside our textarea and save it. Here is the screenshot of the output at the front-end. Now let's create this option inside an admin tab. I created a textarea option with ID aa_txtarea_in_tab1_panel2 inside an admin tab $aa_panel2. It appears against the name My Textarea Option. The above screenshot shows this option inside my second admin panel, i.e. Neat Options 2. Again get an instance, then use the getOption() function and enter ID as its parameter. Next I'll print the output at the front-end using the echocommand inside a div tag. I'm using the same dummy text once again as an example. The final result is shown above. Now, I'll create a textarea option inside a metabox. The createOption() function adds a textarea with ID aa_mb_txtarea inside a metabox $aa_metbox. This option appears on all page/post editing screens. The screenshot above shows a textarea named My Textarea Option right at the end of a page editing screen. The same also appears inside the Add New Post section. Now I'm going to write the code for retrieving its saved options values. Repeat the process again, i.e. get an instance first, and then use the getOption() function and submit the ID of the textarea with the ID of our post_type. The result is saved in a variable called $aa_mb_txtarea_val. Finally, I echoed the output in a div tag. Let's upload the final output at the front-end. Let's move to the final part where I'll create a textarea option inside a theme customizer section. A textarea with ID aa_sec_desc_txtarea exists inside a theme customizer section $aa_section1. 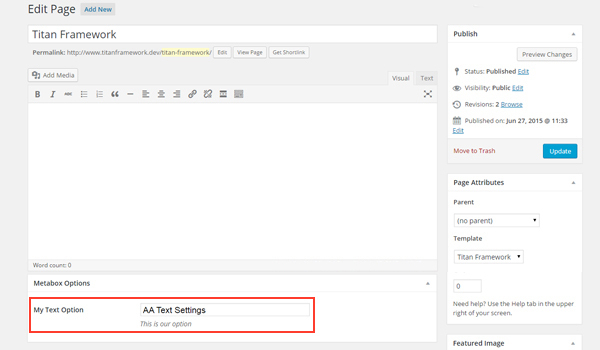 A textarea type option in the above figure is displayed against the name Site Description Textarea within the My Section theme customizer section. This code retrieves and prints the value in pretty much the same way as discussed above. Here is the live preview of my input. 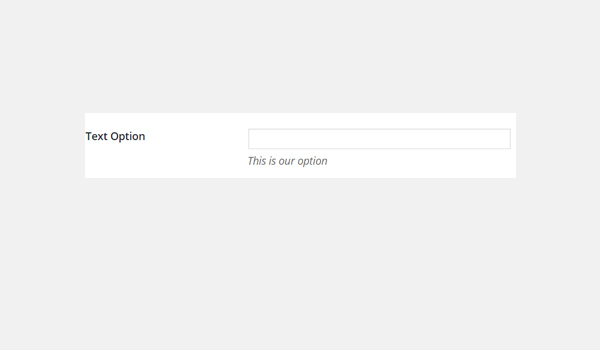 You can use this option, for example, to add a brief description on your landing page. That's about it. 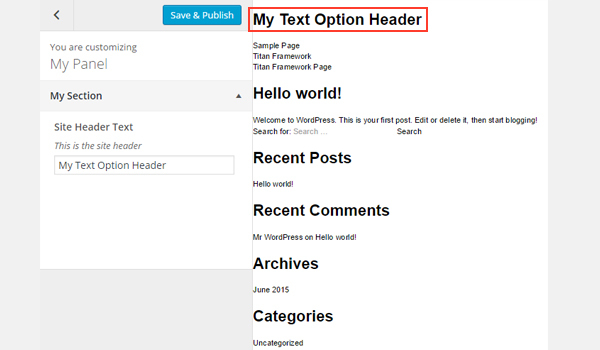 Now you know where and how a text type option and the textarea type option can be added with Titan Framework. I have seen people who build products abuse the text type option in places where an end user might want to add more data than just a few words. You should always use the textarea type option in such a case. The entire process is pretty simple and easy. I hope you enjoyed reading this article. If you have any queries you can comment below or reach out to me on Twitter.